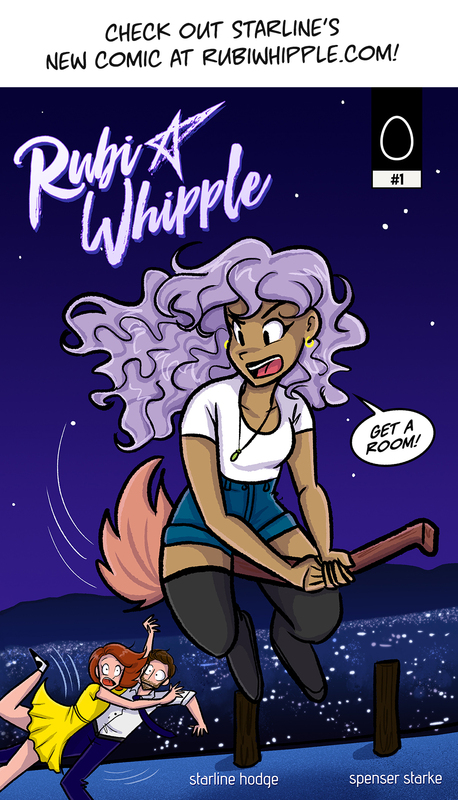 I launched a new webcomic this month called Rubi Whipple! It about a curse-breaking witch in Los Angeles trying to break her own un-breakable curse and help her friends and clients along the way. I hope you enjoy it! As for Candi, it's still on hiatus! I have been thinking about ways to either finish up this story in writing or re-launch it as short-form comic. But it's not currently priority at the moment. Candi's been up for 12 years now and I'm super bur to nt out on it. I have a bunch of other ideas that I want to work on and general art stuff I wantdo that I'm more passionate about. I draw and make graphics for a living, so when I do get to draw for "fun" I want it to be something I'm excited about. So I'm going to stop working on Candi for a while, and maybe I'll get back into drawing them again (maybe with a new story too?). I don't know yet. You can see the other projects and art I'm working on in the meantime at my Tumblr or Twitter page. If you need some resolution to the Candi story... well almost everyone graduates. Some updates! Candi schedule is probably going to continue to be a bit sporadic for a while since I'm working on several projects and such. I will keep trying to update 4 times a week, but it will most likely be around 2 or 3. I’m participating in the 100 Cupcakes Project to raise money for No Kid Hungry! Let’s feed some kids! I’ll post more cupcakes as they start going live on the site. Each one that I’m working on is 8x10in, ink & gouache, on watercolor paper. For more information about the 100 Cupcakes Project, read here. It's my 33rd Birthday today! So I keep forgetting about Candi's anniversary in June! But better late than never. Here's to 11 years! Anyway, be sure to follow my Tumblr, Instagram, Twitter, to see extra art or extra bits of my life if you are interested in that sorta thing. Also, I super appreciate those who have been supporting Candi via Patreon or those who have been buying Candi art from my Etsy shop! It's been incredibly helpful and it keeps the site going! Thanks again! Follow Starline on Twitter for more art & Candi news! Starline X. Hodge is a Los Angeles based Cartoonist and Graphic Designer.